Flight is at 10.30 AM so I don't have to get up every arly. I arrive at the airport 1 hour before departure (which is what I normally do) and can already say that the people on the plane are different from the ones I am used too: they are TOURISTS ;-))))) Flight is packed and long before boarding there is a long line. As I want an aisle seat I am not in a hurry as I know that tourists come in two and usually one of them wants a window seat. :D And of course I get my aisle seat... flight is unspectacular till we land... jeeeeeez, who introduced that crazy habit to applaud after landing (most people don't know that one of the most dangerous moments of a flight comes AFTER landing as lots of planes haven't been able to stop in time and landed in a field... *hehe* ). Once I am in the airport I have to walk about a mile to get my suitcase and then I am out and about. I have bought a 3-days Barcelona card online which gives me free rides on public transport and discounts to a lot of museums etc. So I go and get it and then look for the airport bus. Can't get on the first one as there is a long line but I am not in a hurry so it doesn't really matter. Once in the bus I get a first glimpse on the city on my way to center town. The bus is going to Plaza Catalunya which is the main square of Barcelona. From there I have to go 3 stations by subway to my hotel the aparthotel Silver. This has been recommended to me and was rather cheap. I have a kitchenette I don't necessarily need but the room is big enough for me, has warm water and a safe and that's all about it takes for me to be happy in a hotel. I unpack fast and then I am off (it is already 3 PM by now and there is not much left of day day... ;) ). This terrace was supposed to be a market (according to Gaudi's original plans) and it has a magnificent view over Barcelona). As it was already getting late and they were closing I didn't enter the church either and headed on towards La Rambla, the main street where people go to have some fun. 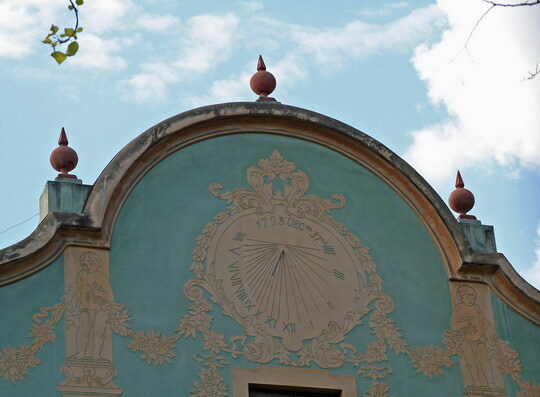 On the evening before I went to Barcelona I finally found the day trip I had been looking for when I first started planning the trip: going to the Dali-Museum in Figueras. Saw it only after I had booked my 3-days Barcelona card so of course I lost money but I had been dreaming of seeing this musuem for about 20 years so I didn't wanna loose that occasion. We had half an hour to get some coffee and I went with the canadian guys from Montreal, the australian and the guy from Los Angeles to a bar. Problem was we were just ignored there... at some point the waiter told me he would wait on us but what we did was waiting... :D so while we were waiting time passed and then we didn't have any time left to get coffee... bad luck for them - business lost.... the square was nice though. This street reminded me a lot of Tuscany. I think this was a monastery. Have to say a few words before posting more pics. I knew Dali was a genius and a great artist. I knew too that this guy was so crazy that he was over the edge. Till sunday I hadn't realized though how much of a genius he really was. 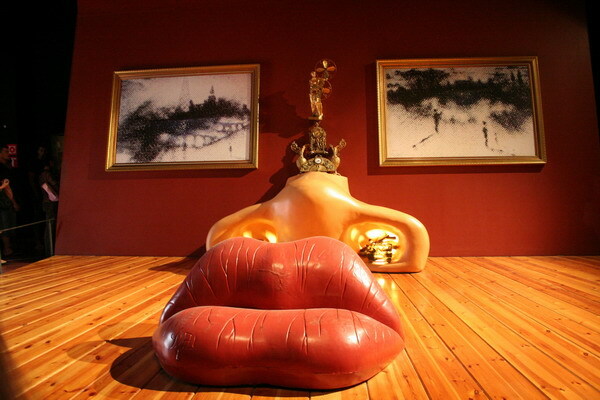 I knew most of the more famous pieces of art which are in the Dali museum in Figueras but you understand some of the ideas only when you see them in person. I will give you examples in the pics I'll post further down. In the courtyard. The statues represent the 'Oscar' but Dali made them all female. 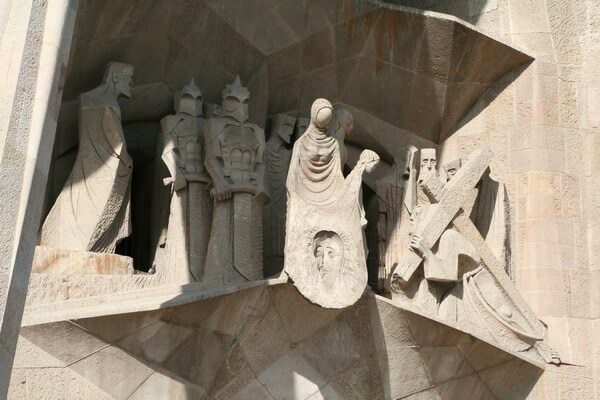 One of the more famous pieces (I think it is called something like 'schizophrenic torrero' but not sure about that). This is one of the art works which are really amazing. In the middle are two mirrors and to the left and the right are one painting each. Now when you look into the mirror the two paintings melt into one. The fantastic thing about is that it doesn't matter how much you move your head to the left or the right, the two images ALWAYS fit into one piece.... and there were several of them. And another example: this is the entrance hall of the museum. You see a painting with the face of Abraham Lincoln. I had seen this before and knew it was one of the paintings with double meanings. When you are close you see his wife Gala standing in a window but at the same time it is the face of Abraham Lincoln. What was really amazing though was that looking at the painting with your eyes you see Gala. But when you look at it through your camera you see only Abraham Lincoln (which is what you see on that pic as well). It was absolutely amazing and I have never seen anything like that. When I finally left the museum after about 2 hours I was so fed up that I didn't go to the second one which contains jewels designed by Salvador Dali. And this is the famous wall outside. The small yellow things on the red walls are all bred as Dali liked bread a lot (of course it's not real bread). The museum from the other side. Another tapas bar. Till Stewart told me I hadn't known this kind of tapas existed. There are different toppings on the bread. You get a plate and go around and take whatever you want to eat. In the end the toothpicks are counted and you pay based on the number of them. This was already the last day. I slept in but decided not to have breakfast in the hotel but to drink a coffee later on in a cafe. By 9 I had checked out and left my suitcase in the storage area of the hotel and went to Casa Batllo. Casa Batllo is another one of the buildings designed by Antoni Gaudi and it has been declared World heritage by the UNESCO. This time I went inside. Inside a lot of things are made of wood. The main theme of the building is the ocean so you see lots of waves and blue stuff there. The amazing thing about these glas windows are the small dots you can see in the middle of each glass. They contain a bubble of the air of the time they were made. This is one of the windows on the big window you see on the first pic. As you can see this house doesn't need any air condition as Gaudi designed it in a way that the air could circulate freely. This is the back from a deck. Unfortunately I didn't capture the waves in which the pavement was built. Ocean theme again on the stairways. The square in front of the cathedral. Wasn't worth taking a pic of the cathedral itself as it was under construction and mostly covered with tissue. 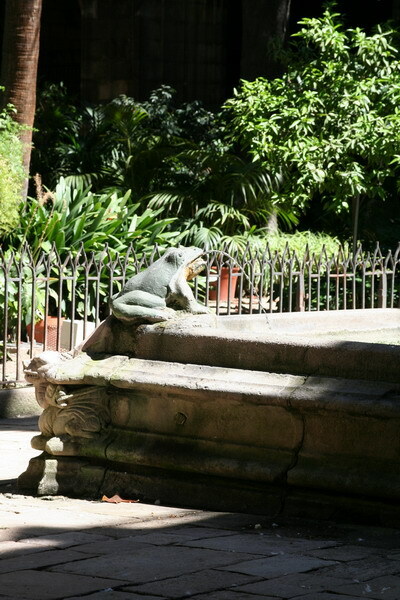 Both the previous pics were taken in the cloister of the cathedral. The main altar inside the cathedral. Children playing on the roof. I think this was part of a Kindergarden. Part of a tower of the cathedral. The black Madonna (had to take a pic as we have a black madonna here in Cologne as well and at least here she is very special). One of the artists on La Rambla (I would have sweated like a pig... ;-)))) ). Dali again at La Rambla. And a covered street (glass roof over it). Then it was time to go back to the hotel, get my suitcase and take the bus to the airport. On the way I saw the Royal Palace I should have visited as well as it looked magnificent... didn't have nearly enough time though. Only conclusion is: I have to come back and I will!